Jack Daniel’s Racing has locked out the front row for the Sunday race of the ITM400 in Hamilton, New Zealand this morning. Rick Kelly scored his sixth V8 Supercars Championship pole in his #15 Jack Daniel’s Commodore, with brother and team-mate Todd to start alongside in second place. 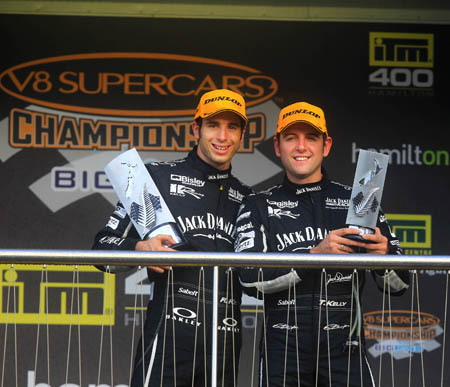 The pole is the second for Kelly Racing, the other also scored by Rick Kelly on Sunday at Winton Motor Raceway in 2010. The result comes after Rick Kelly scored the organisation’s first race win on Saturday at the Hamilton street circuit, with Todd Kelly finishing in third. Kelly Racing stablemate Greg Murphy was also right on the pace in this morning’s qualifying session, which was held in changeable weather conditions. The Kiwi ace will start from fifth place in the #11 Pepsi Max Commodore.